large villa, air-conditioned, divided into two apartments, ideal for two couples with children, located in a very quiet residence with large terraces, one with barbecue for meals overlooking its private pool and sea views. The villa is surrounded by a large garden. You will have inside the villa with all the comforts for a good holiday. Beautiful beach of Canyelles with its restaurant near the villa. 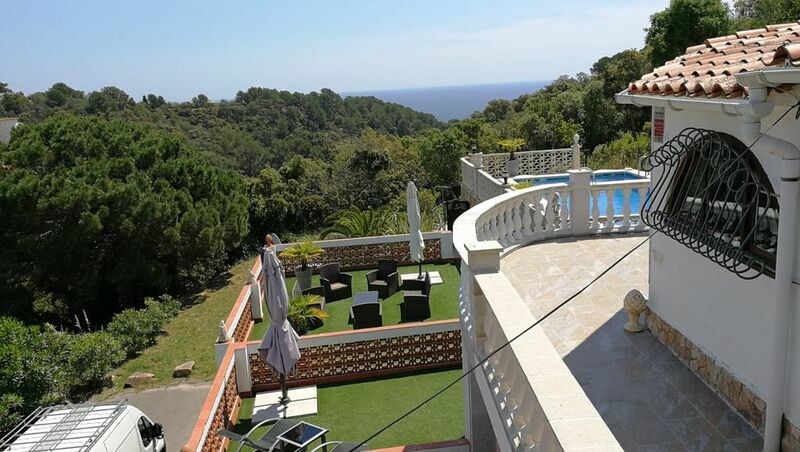 Very sunny, friendly, typical Spanish villa surrounded by greenery. Wifi included in the rental. Bath towels are not provided. Cleaning is not included. It is at 90 € for the entire house. We came to this villa at the end of August 2018, we are a family of 5 (myself, my wife, two daughters and my son) as there was only 5 of us we stayed in the top villa, there was more than enough space for us, I would definitely come back to this villa, the kids loved the pool and we were just a ten minute drive from the shops, Florence and her husband are very nice people and do their best to accommodate, 5/5 from us for this amazing family get away. I thank you very much for your appreciation, I am totally delighted that you enjoyed our house and that you had a great holiday. It is with great pleasure that I will welcome you again. Замечательная вилла для отдыха двух семей, состоит из двух домов. Вилла находится в тихом районе, соседи только с одной стороны, много зелени вокруг. Собственный бассейн, зоны отдыха, барбекю. Чисто, аккуратно, просторно, добродушные хозяева. От самой виллы до дикого пляжа около 10-15 мин пешком, до песчаного обустроенного пляжа на машине около 5 минут. Рекомендую это прекрасное место. Спасибо хозяевам за отличный отдых! Es war traumhaft schön. Vielen Dank! Wir waren zufrieden. Rundum glücklich! Waren hier Ende Mai 18 - und zufrieden. Die Anlage besteht praktisch aus 2 abgeschlossenen Einheiten auf einem Grundstück. Rundherum Zaun/Tor und abschließbar. Ausstattung ist Top - alles vorhanden was benötigt wird. Nur 4 Sterne weil die untere Wohneinheit schon etwas ab gewohnt und renovierungsbedürftig ist. Ich danke Ihnen für Ihre Wertschätzung. In Bezug auf die untere Wohnung ist die Renovierung für nächstes Jahr geplant, weil wir in diesem Jahr alle oberen und vergrößerten Terrassen renoviert, die Klimaanlage gestellt und viele Fenster verändert haben. Wir haben viel Geld investiert. Aber die untere Wohnung wird nächstes Jahr bis zur Top-Wohnung reichen. Aber es ist wahr, dass es oben so schön ist, dass der Boden viel weniger luxuriös erscheint, während es sehr sauber und sehr gut gepflegt ist. UN VRAI PARADIS POUR UN SEJOUR IDYLLIQUE ! From France take the motorway to Lloret de Mar exit (exit 9), take Lloret de Mar (about 14 km). Crossing Lloret de Mar, Tossa de Mar. management Riding on 4 km, turn right at the sign "the Urbanisation- Playa Brava" (yellow sign). Follow the yellow signs to a hairpin bend: you will have an intersection of three roads. Turn right. The Villa is lacated at a dead end right. Pretty cove reached via a path behind the villa (gate in the garden) for walkers. And numerous hiking trails to admire stunning views. Tossa is 4 kms 5 with its pretty shopping streets with many restaurants and its market Thursday morning. Lloret de Mar 5 km to casino, water world attraction park and its large market on Tuesday morning.